Caricatures Ireland by Allan Cavanagh, Caricature Gifts All Over Ireland! Welcome to Caricatures Ireland by Allan Cavanagh! Caricatures Ireland by Allan Cavanagh: here you can order a gift from caricature artist Allan Cavanagh for weddings, retirements, birthday presents, or any other occasion! From Galway to Dublin, Cork to Donegal, and everywhere in between. My caricatures start at just €50 for black and white head and shoulders. I create signing boards for weddings on board or canvas, displayed during your drinks reception for your guests to sign. These are highly personalised and much treasured after the big day! Click here for my very latest live wedding and corporate caricatures, and commissioned caricatures for birthdays weddings and retirements! Looking for a caricature artist for weddings? I draw caricatures at weddings all over Ireland. I can draw caricature couples in 3 minutes, and my paper is printed with the names of the couple and the date of the wedding. It’s a great ice-breaker for wedding drinks reception and will have your guests in stitches laughing on arrival! 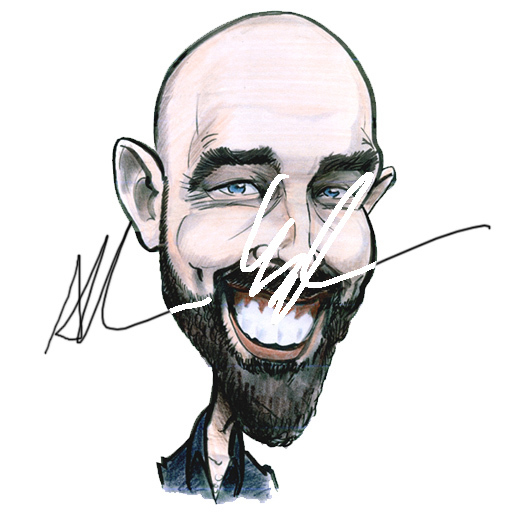 I’ve drawn my live wedding caricatures at wedding venues all over Ireland for over 20 years. Contact me today for this unique wedding entertainment. Where can I get a caricature done? Right here! You can order caricature here, or contact me here. Phone me on 0877599249. Have a look around and if you’ve any questions just drop me a line or leave a comment! I’m also on Facebook, Instagram, and LinkedIn.